Firestick is one of the most popular streaming devices. The interface is much similar to an Android TV box. Firestick is well suited for people who would like to search and watch new shows on their regular television. Without apps, you can’t use firestick to the fullest extent. In this article, we will share some of the best apps to install in your firestick, to use firestick to the fullest. There is no device without youtube, youtube has become a part of our daily life. Its one of the best app to find your favorite contents. And its the worlds best and largest video database. It doesn’t need any further explanation. You cant watch movies and TV on youtube. This is where the Netflix comes into play. On Netflix, you can watch movies and TV shows. The subscription cost is around 8$ per month. It has lots of unique web series. This is similar to Netflix in India. If you think Netflix is expensive, you may try hotstar. It includes some of the HBO premieres shows like game of thrones, Westworld, silicon valley and lots more. With hotstar, you can also watch Marvel and Disney movies. It streams TV shows like modern family, homeland and few more. If you are music freak, then you must install this app. This app is especially for music lovers. If you are using youtube to listen to music, then give this app a try. And categorization in this app is also great. It has top 50 list of everything. Which includes, top 50 Hollywood songs, top 50 English songs, top 50 pop songs and so far. It is vastly providing the content of 16 languages. It has one of the largest music databases. It also provides internet radio. Depends on the language, you can change the radio. This ditto TV is especially for Indians. Though firestick is not so popular in India Yet. This app allows the user to stream live TV contents. And the cost is around Rs. 20/month. Its one of the most affordable premium streaming services in India. Check the Ditto TV to make sure that your favorite channel is available in the pack. There are lots of free media player, but nothing can replace VLV when comes to performance. It is one of the best media players in the market. It allows you to play media files from the various location like the local library, network, or stream. To stream directly from the internet, you need to install codec with your VLC. And you also need m3u file to stream the contents. Kodi or XMBC is one of the most advanced streaming software. There are various methods available for installing kodi on firestick. It can stream contents from anywhere. And its mostly used to stream movies and TV shows. To stream any content you need the help of addons. 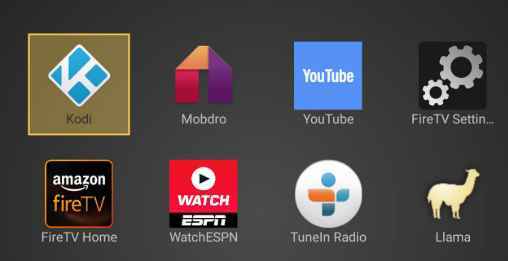 With addons installed on kodi, you can stream any media available over the internet. It was officially removed from the Amazon app store. Because it has the potential to stream all the Netflix content for free. And who knows, maybe even better. These are 7 best apps for amazon firestick. These will change your firestick experience. We highly suggest you install this app and use your firestick to the fullest extent. We also added some of the additional apps. Hope it will make your firestick experience better. Whatever device you are using, you need a file manager to manage your files. And ES file explorer is the best when it comes to file manager apps. You can find this app in Amazon app store. It helps to manage internal memory of your amazon fire stick. Though, we have lots of apps to stream. Nothing can beat the streaming via the browser. And it also helps to surf contents if needed. And as we all know chrome and Firefox are the most used browser. You can directly install any of this browser from the Amazon app store, and enjoy surfing the internet on your TV. Social media has become a part of your daily life. You can download and install any of your social media from amazon app store. Go for a lite version, since it consumes less memory and gives high performance. These are the list of the app you need to change your firestick experience. Hope this article is informative. share this with your friends.